Predicting the future is a tricky thing. I myself have correctly predicted three stock market crashes, the rise and fall of two major civilizations, as well as the winners of 38 of the 44 Super Bowls. Alas, when it comes to predicting the future of Rocket Motorcycles, I defer to the professionals. And who is more qualified to predict the future of technology than Hollywood movie producers? I can think of no-one. If they can dream it, surely it's just a matter of time before the engineers can build it. So, without further ado, let's see what the LA-LA Land Dreamers have to say about how our Rocket Cycle Future will progress. Why Do Bird-Men Need Flying Motorcycles? 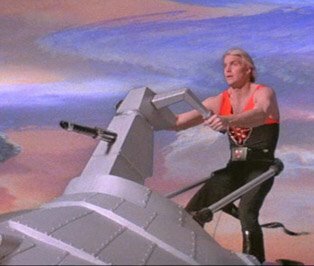 Other than its campiness, Flash Gordon was loved (by me, anyway) for its modest view of the not-too-distant and not-too-high-tech future. Take this rocket cycle, for example. Built by a race that has no clear need for it (the Hawkmen), it has no way of aiming its main weapon without also turning the bike itself. The Hawkmen also forgot to install a GPS, which becomes clear to the viewer when rider Flash exclaims "Mayday! Mayday! I'm flying blind on a rocket cycle". I'm assuming these guys worked for the government? Quibbles aside, I once owned a jet ski that was more advanced than this puppy, so I sure hope we're not headed in this direction. Oh, and Flash, I just love those pants. 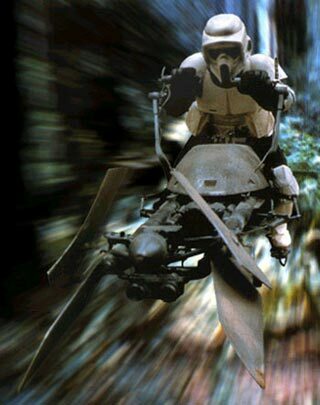 As saddened as I am by the prospect of a future that includes Hawkmen Rocket Cycles, I am equally as excited about getting my hands on a 74-Z Imperial Speeder Bike. These babies accelerate from a standstill to 300 mph in about 1.5 seconds. They turn on a dime and come equipped with an optional light blaster cannon. The only concern I have is that they seem to be a bit too quiet. When I'm going that fast, I want people to know I'm coming. 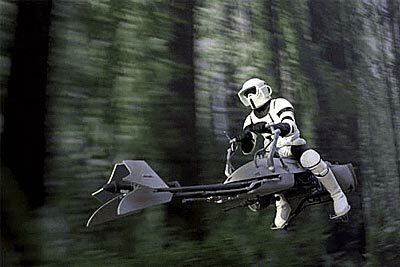 I guess I'll just have to wait for a set of after-market loud pipes before commuting on my new Speeder Bike. Despite the advanced technology, you'll no doubt be surprised to hear that pre-orders for this model are now being accepted. Send $9,000,000 USD in small unmarked bills to this website and expect delivery in late Winter of 2175. San Francisco based artist Norio Fujikawa is not a Hollywood special effects designer, but he might as well be. No doubt drawing inspiration from the Imperial Speeder Bike featured above, Norio brings us one step closer to reality with this flying Jet Bike. Norio's job is to dream big, and we're here to speculate about what the future might bring, so we'll cut him some slack. But it seems to us that, if you came back to earth just a touch, and added a few tires to this thing, it might just be a viable production concept. Or... we can keep dreaming and imagine this one hitting assembly lines in 2090. I love that Norio can imagine a flying bike, but can't imagine we're going to do away with the honkin' huge tailpipe. See that little white button on the dash? That's the turbo button for setting off the rockets. OK, it's time to come back to reality and see what Hollywood thinks might be accomplished in the not too-distant future on this planet. When you're producing a low-budget TV show that has very little chance of being renewed, you've got to make due with what you've got. 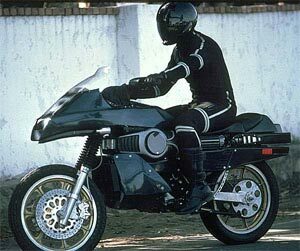 Street Hawk — a blatant ripoff of Knight Rider — was that show, and the cycle of choice certainly showed its 1984 economy-class lineage. Don't get me wrong, I'd drool for its rocket-powered Hyperthrust engine capable of hitting 300 mph. I'd put a down payment tomorrow on a standard weapons system that included laser cannons and rocket launchers. And I'd sleep out overnight to be the first guy on my block with a 'Compressed Air Vertical Lift System'. It's just that I want my future rocket cycle to be something a little snazzier than a Honda dirt bike. 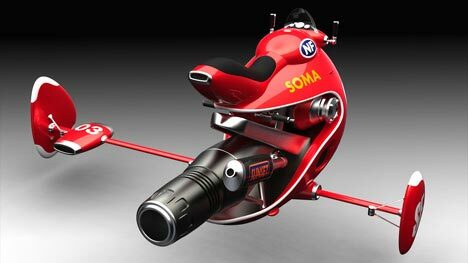 Of course, not all Hollywood dreamers see our motorcycle future as being rocket-laden. 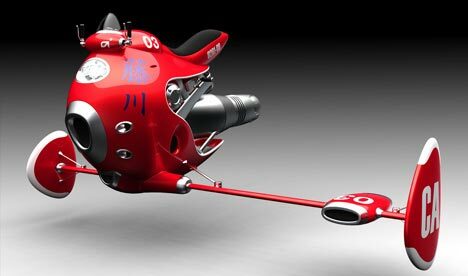 Shame on them but, in the interest of competitive analysis, we need to at least examine one of the leading contenders to replace rocket cycles as the futuristic commuter vehicle of choice. 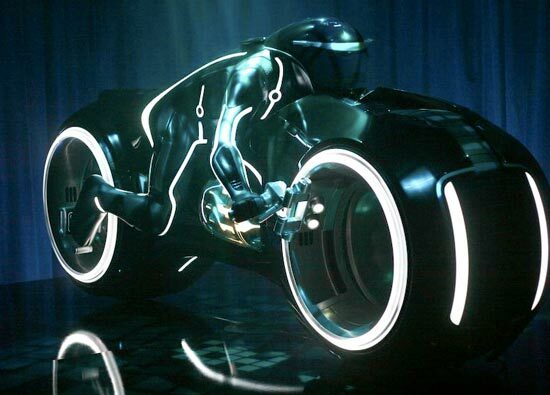 As a kid, I drooled over the Light Cycle from Tron, but as an adult I now see its limitations. Sure its acceleration is unrivaled, its looks are to die for and it can make a ninety-degree turn at extremely high speed. But I see two major problems with this bike in comparison the rocket cycles above. First off, it creates an impermeable wall of light behind it. I'd like to knock off that obnoxious tailgater as much as the next guy, but this seems a little extreme. And secondly, it lacks the ability to run outside of a pre-constructed electrical grid. What's up with that? I'm told that this problem will be fixed in Tron Legacy, but you know how technology works... the promises of Version 2.0 never live up to the dreams of the early adapters. I'll stick with my rocket cycle, thank you very much. 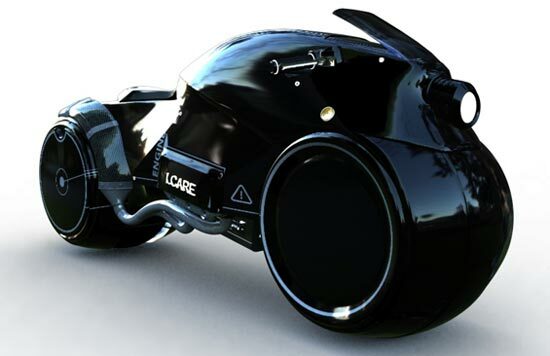 Amazingly, someone actually designed a current-day concept bike around the Tron cycle. French maker Enzyme has been known to turn a concept into reality on occasion, so who knows? Maybe our rocket-cycle future will be pre-empted before it ever really gets started. I'm banking on not.